Knowledge Panel Exploit Is Embarrassing For Google | The SEO Dr. Yes, Aaron Bradley, an SEO, wrote about this issue on Google+ back on March 31, 2016, over 2 and half years ago! But now, only now, is it getting attention. It is not like major sites didn’t cover this exploit, they did. Google just did not think it was a big deal and didn’t fix it. Google still hasn’t fixed it – even after last night’s news. I am sure they will fix it soon but almost 3 years to fix this is kind of insane. You can just imagine what people can do to trick unsuspecting searchers into believing anything. 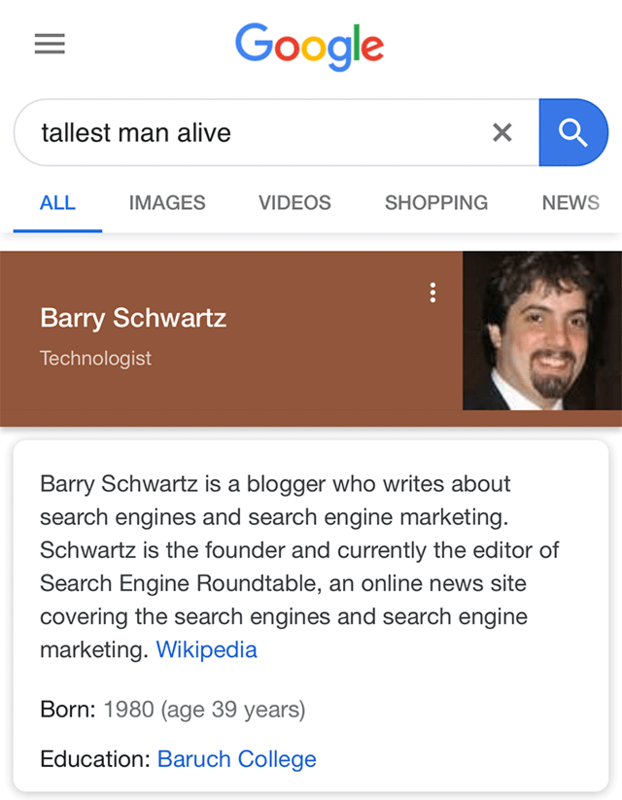 Just share a long Google (or short one) URL with them, to prove you are who you say you are, your company does what you say it does, etc and bam – Google backs it up with a knowledge panel. How does it work? Go to any knowledge panel, click on the share icon at the top. Copy the URL and paste it into your browser. Then look at the URL the &q= part, right after that is the original query you used to trigger this. Change the query like I did to anything you want. For an added bonus, do it on mobile and the knowledge panel will be the only thing you can screen shot above the fold.